Laricobius beetles have been released in New York since 2009, and now we are investigating whether or not those original beetles have been able to survive and reproduce. To check on the status of these biocontrol populations, we have been spending time during the past two months surveying for beetles near our previous release sites. The presence (or not) of Laricobius beetles allows us to assess the success of our biocontrol program. Last week we visited the High Tor Wildlife Management Area, a NYS-DEC property where Laricobius beetles were released several years ago. 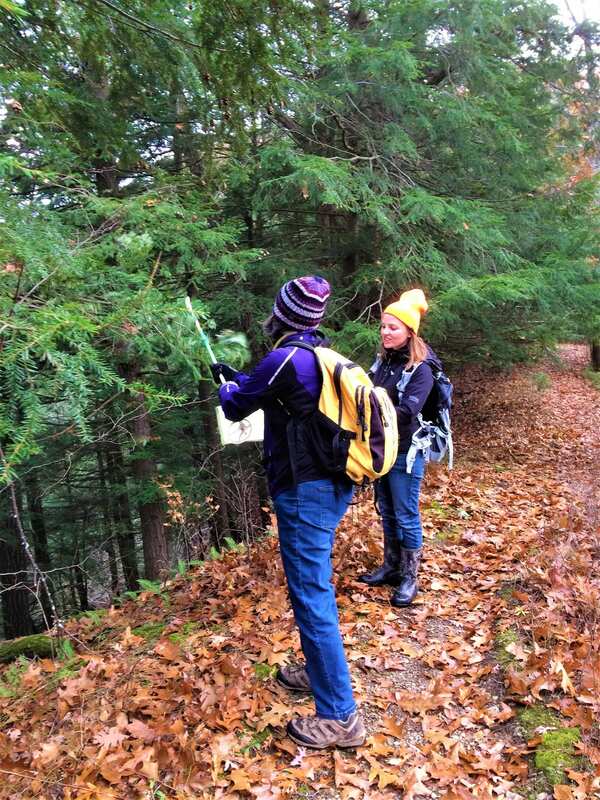 We were joined by several members of the Canandaigua Lake Watershed Association who volunteered to help us survey the hemlocks for beetles. 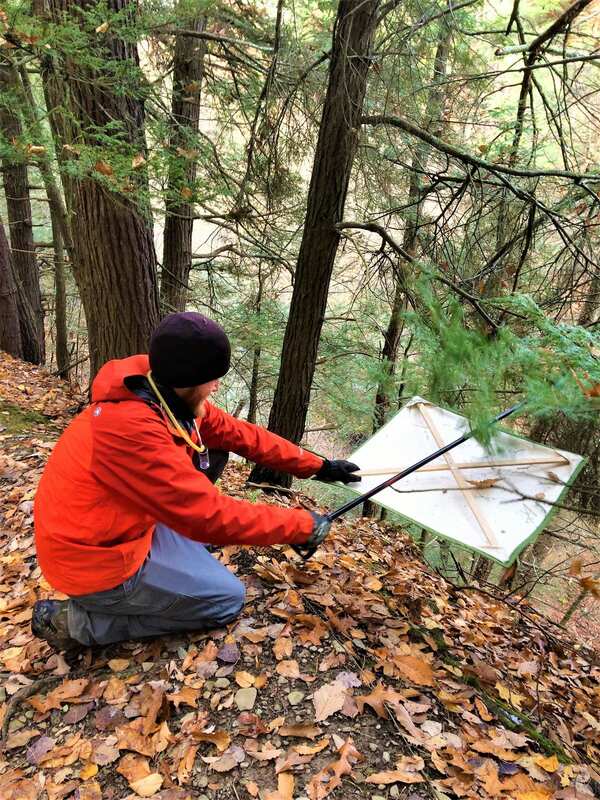 To survey, we take a fabric square called a “beat sheet” and hold it beneath a hemlock branch infested with HWA. Then, we use a stick or ski pole to gently tap the branch over the beat sheet. We peek in the fallen debris on the sheet to see if any beetles have come off of the branch. When we gently sift and shake the beat sheet, the Laricobius cling to the fabric, which helps us find tiny beetles among the needles that fall off the branch. 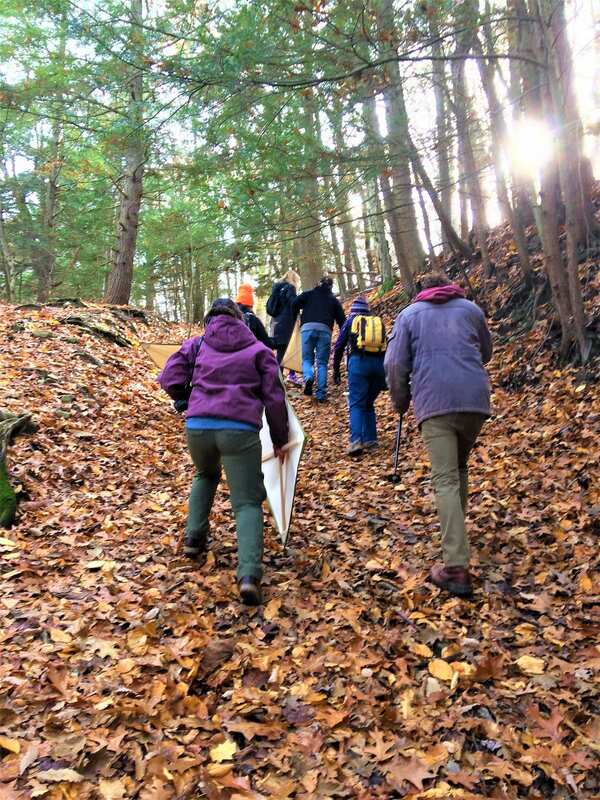 At High Tor, we were able to uncover only one Laricobius beetle, but we have found several beetles at other release sites like at Van Riper, a Finger Lakes Land Trust property on Cayuga Lake. Our beetle findings, though relatively few in number, show that the Laricobius we have released have been able to reproduce and are maintaing small populations around the state. These results are encouraging. The ability for biocontrol insects to survive and establish in New York is critical to our biocontrol program, and surveying helps us find out where beetles have been able to maintain populations. Ultimately, we hope that HWA predator populations will reach high enough densities to keep hemlocks from succombing to HWA infestations. Until then, we’re keeping an eye out for Lari beetles in the foliage and continuing to release to bolster existing populations. Want to learn more about how to survey for HWA predators? Email us at www.nyshemlockiniaitive@cornell.edu.